Under the agreement, Asia Bibi’s name is on list of people barred to leave the country. The government will compensate victims of recent violence. The Islamic group Tehreek-e-Labbaik Pakistan will apologise if protests hurt people’s feelings. Islamabad (AsiaNews) – The agreement reached last night between the Pakistani government and Islamic radicals who want to overturn Asia Bibi’s acquittal is a cause for shame, this according to Kashif Hussain. Speaking to AsiaNews, the social media writer and activist slammed the agreement between Imran Khan’s government and Tehreek-e-Labbaik Pakistan (TLP), an extremist party, to stop protests that had blocked the country’s main cities for days. “If a state cannot stick to its orders and if its citizens [can] challenge the writ of the state and do not follow the orders and law, then this is a big question mark on state’s stability,” he lamented. One example of this is Asia Bibi's lawyer flight from Pakistan this morning. Another is the fact that the fate of the Christian woman, acquitted a few days ago of blasphemy after spending nine years in prison, is now uncertain. “We were expecting the state to act against the anti-state forces that are disgracing Pakistan across the world and teach them a lesson that state’s orders are above all, but the agreement with such group ashamed us,” Hussain added. Two days ago, Prime Minister Imran Khan had accused Islamic radical of offending Islam, giving the impression that he was going to take them head-on. 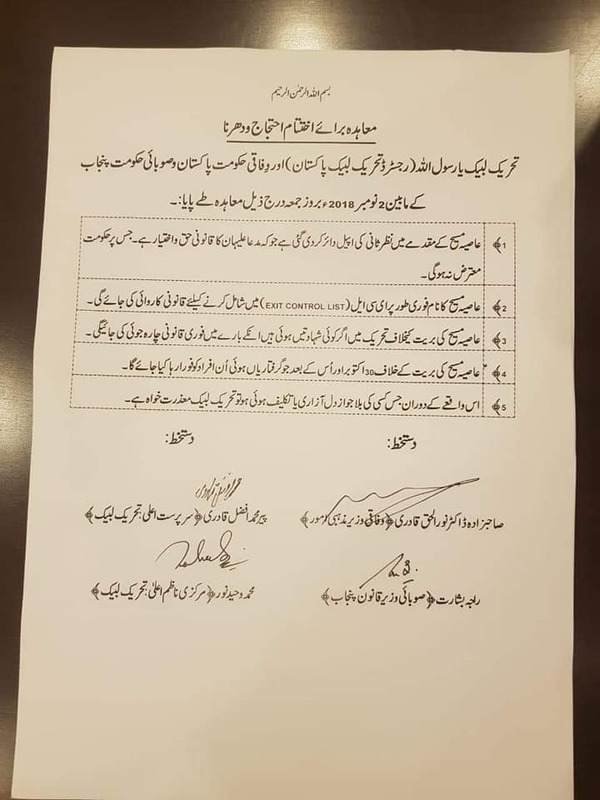 Last night however Punjab's Justice Minister Raja Basharat, Religious Affairs Minister Noorul Haq Qadri, and TLP leader Pir Muhammad Afzal Qadri signed a five-point agreement. 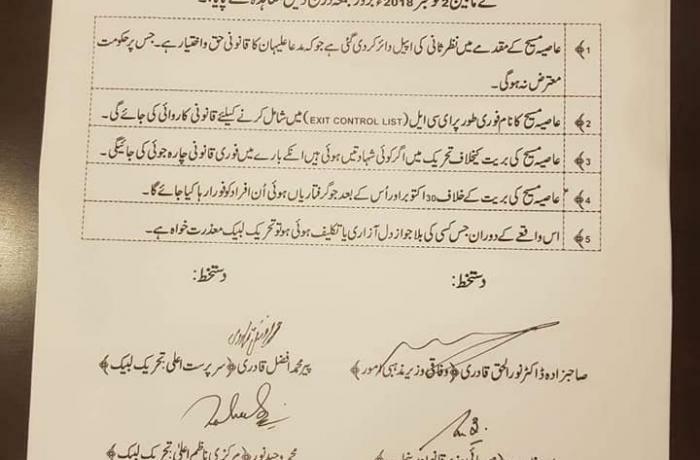 Under its terms, Asia Bibi’s name was added to the Exit Control List to prevent her from leaving the country. The government said it would not oppose the request for a revision of her acquittal. It also said that it would compensate the victims of the protests as well as release protesters arrested in recent days. Lastly, the TLP agreed to apologise if the protests hurt people's feelings. Irfan Mufti, deputy director of the South Asia Partnership Pakistan, welcomed the Supreme Court’s ruling but complained that "the problem remains with the blasphemy laws”. Sadly, the “majority still believes on keeping these laws”.